* * * * * * * * * * Welcome to Dru's Cozy Report: February 2015. This month we have one NEW series for your reading pleasure. Enjoy! Lucy is thrilled to land a librarian job in her favorite place in the world. But when a priceless first edition Jane Austen novel is stolen and the chair of the library board is murdered, Lucy suddenly finds herself ensnared in a real-life mystery—and she’s not so sure there’s going to be a happy ending. I love it. 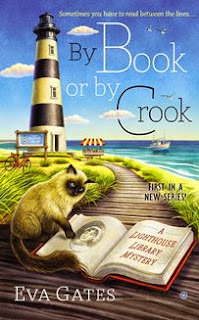 A library in a lighthouse, what a perfect setting that captured my attention from the first page all the while making feel at home, as I read my way to an ending that was justifiably served. I love the ease of how the story progressed that made it hard to put down, as it quickly became a page-turner. Lucy is a gutsy heroine who took a stand and made a new beginning for herself and showed her loyalty by gathering as much clues as she could to prove her friend was not responsible for the murder and thefts. The mystery kept me glued to the pages and I love all the twisty turns to make me ponder who was behind these acts. Boasting a diverse cast of characters, engaging conversations, and a small home town-feel, this was a very enjoyable read and I can’t wait to see what happens next in this delightfully charming debut series that I hope is here to stay. It's on my library list. Thanks. Thanks, Dru. I'm glad you liked By Book or By Crook. Look for Booked for Trouble in September. I love your report, Dru and look forward to it all month! Great job. Great review Dru, adding this to my wishlist. I am a huge fan of Kate Collins...! :-) And it's also a great pleasure to discover several 'new-to-me' authors and to add their books to my TBR list as well...! These days I am busy preparing an upcoming post titled "Cozy Mysteries (February, 2015)" for my blog ...and would like to link this page as well ...since this book is somehow not mentioned in the website pages that I usually link to my latest cozy mystery books releases posts.